Ingar has been exploring Upper and Lower Lough Erne over the last 10 days or so. From moving up and down the full extent of Upper L Erne in the early part of Oct Ingar headed north-west to Lower L Erne on 17/10, roosting on Boa Island at the north end of the lough on 18/10, before heading back south past Enniskillen the next day. He has some beautiful country to himself...or has he? The first white-tailed eagle chicks of the year have been hatched in Co Clare and westCork in recent weeks, it was announced today. The rare birds were born in nests at Mountshannon, Co Clare and Glengarriff in west Cork, according to the Golden Eagle Trust which runs the reintroduction programme . The chick born in Mountshannon is a sibling of a bird which was shot and killed three months ago. The deceased bird was one of two chicks born to the Mountshannon pair last year which became the first chicks to fly from a nest in Ireland in over a century. The crime is under investigation by the Garda. The chick born in Glengarriff, the first of the year to hatch, uunfortunately died at two weeks old. This was likely due to a combination of bad weather and inexperienced adults, Golden Eagle Trust project manager Dr Alan Mee said. Nesting pairs at sites in Kerry and Galway have also laid eggs which have yet to hatch. At least half of the fourteen pairs of eagles across four counties have nested and laid eggs in recent weeks. Some pairs, including a nest in Killarney National Park, failed to breed. These are the latest chicks in the reintroduction programme which began in 2007 with the release of 100 young Norwegian eagles in Killarney National Park . Minister for Arts, Heritage and the Gaeltacht Jimmy Deenihandescribed it as a “very promising development” after the shocking killing earlier this year ” “That was a dark day for this ambitious project to reintroduce these magnificent birds of prey into Ireland,” he said. “I hope these young eagles will have a long life in our skies,” he said. The pair at Mountshannon gives the general public a chance to see some of the most “spectacular birds” at “close quarters”, he said. Dr Mee warned about risks of disturbance during the early stages of nesting which would be detrimental to success and could result in chicks being left unguarded. “We would caution people not to approach the nest area but instead avail of the unique opportunity to watch from a nesting pair of sea eagles from nearby Mountshannon pier,” he said. The increase in the number of nesting pairs is “encouraging” and “bodes well for the future of the species” he said. White-tailed eagles can live for 25 to 30 years and generally mate for life. “Ultimately the viability of the reintroduced programme depends on these chicks going on to breed themselves in Ireland. Each step brings us closer to that goal,” he said. The reintroduced birds came from Norway and the Norwegian Ambassador to Ireland also welcomed the news: “ This is an excellent example of international cooperation on the practical level, aiming at preserving nature and biodiversity for the benefit of future generations,” Roald Næss said. The white-tailed eagle reintroduction project is managed by the Golden Eagle Trust with the National Parks and Wildlife Service. One hundred white-tailed eagles were released in Killarney National, park between 2007 and 2011 and 29 have been recovered dead mainly due to illegal poisoning. The birds were historically a part of the Irish landscape before being made extinct here in the early 20th century due to human persecution. One of the first two White-tailed Eagles to fledge successfully from a nest in Co. Clare in 2013 has been found dead in Tipperary. The young male eagle was reared by a pair of White-tailed Eagles at a nest on Lough Derg, near Mountshannon, Co. Clare and successfully flew from the nest in July 2013 along with its sibling. After a few months of care by its parents both young eagles began to disperse more widely and become independent of their parents. The last confirmed sighting was of one of the two juveniles near Dromineer, Co. Tipperary, on the east shore of Lough Derg in January. 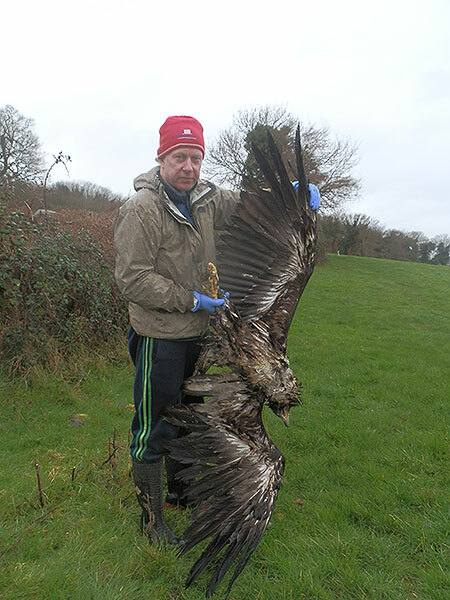 After information supplied by a member of the public and a subsequent search on lands on the shore of Lough Derg by an officer from the National Parks & Wildlife Service (NPWS) and the Golden Eagle Trust Project Manager, Dr Allan Mee, the dead White-tailed Eagle was found near Ballinderry, North Tipperary, on the north-east shore of Lough Derg. Subsequent post-mortem by pathologists at the Regional Veterinary Laboratory at Knockalisheen, Limerick, and radiographs showed the young eagle had been shot, the body holding some 45-50 shotgun pellets. Subsequent post-mortem by pathologists at the Regional Veterinary Laboratory at Knockalisheen, Limerick showed the young eagle had been shot, the body holding some 45-50 shotgun pellets. The impact of the shooting broke one of its legs and wings but the bird survived some weeks after the shooting before dying. The horrific nature of the bird’s shooting and ultimate death has shocked all those involved in the reintroduction project. Jimmy Deenihan TD, Minister for Arts, Heritage and the Gaeltacht, said: “I am shocked by this crime. The birth of this bird was a special day for nature conservation in Ireland. So much work has gone into reintroducing this species here, and there has been wonderful cooperation by many different groups to achieve successful breeding. To have all this undone is a significant blow. Eagles are protected by law. I would urge anyone with information to contact An Garda Siochána or my Department’s staff in the area." Finding one of the first two young White-tailed Eagles to fly from a nest in Ireland shot dead is heart-breaking”, added Dr. Allan Mee, Reintroduction Project Manager. “It is absolutely incomprehensible that someone would shoot one of these magnificent birds but even more shocking is that one of the first two Irish-bred eagles has been shot only 7 months after leaving the nest”. The loss of one of the new generation of Irish-bred chicks comes as a serious blow to the reintroduction project. White-tailed Eagles reach maturity and begin breeding at about 4-5 years of age. The goal of re-establishing a viable population of the species depends on young Irish-bred eagle surviving and breeding themselves into the future. Local NPWS District Conservation Officer Stefan Jones stated that the available evidence indicated that this offence resulted in an especially drawn out and horrific death for this bird: “This bird would have been unable to fish and forage as normal, and it appears that it slowly starved to death as a result. Bearing in mind the broken limbs and the fact that it had approximately 50 shotgun pellets in it, it is amazing it managed to survive for such a period. Investigations are ongoing by both An Garda Siochána and the NPWS and into the shooting. White-tailed Eagles are protected under the Wildlife Act (1976) and it is an offense to shoot or otherwise harm the species. Anyone with information on this crime should contact, in confidence, An Garda Siochána at 067-50450 or the National Parks and Wildlife Service at 076-1002501. An opportunity to celebrate ‘Irishness’ and the environment in which it grew. Exploring & Celebrating people’s interaction with the Irish Landscape over the last 10,000 years? The year 2016 will be marked in some manner, as a notable milestone in this nation’s development. We can presume that public monies will be used on activities, projects and events to mark the occasion, regardless of the broad spectrum of opinion regarding 1916. This is a political reality. The Government has already established a planning committee examining what should be done in 2016. The perceived wisdom, amongst media commentators, is that the Government is anxious to avoid any overt political or nationalistic overtones that could spark any public disorder and damage the fragile peace process. So this discussion paper, suggests one concept that could be discussed and explored before developing it, if it was deemed a worthwhile exercise. What might we celebrate in 2016? The Arts, Sporting, Cultural, Educational, Business and Community sectors will all have their own proposals. But the Golden Eagle Trust propose the concept that we could celebrate how people on this unique island or landmass have developed a rich cultural heritage in close association with its environment and natural heritage, over the last 10,000 years, since humans first arrived on these shores. We could explore, highlight and celebrate the hidden influences of our countryside on a wide array of cultural life. These subtle influences, such as the climate, our coastal or island status, the type of food we grew or caught, our seasonal patterns, the woods, mountains, rivers and bogs all shaped our unique identity and lifestyles. One can deliberately emphasis and celebrate the wide variety of influences that came to Ireland through waves of early and later peoples or through trading contacts across Europe and even as far afield as the Middle East, since the Bronze Age. The influence of nature and the environment on our society, and equally the influence of society on our landscape, is sometimes hidden in Archaeological research or historical records. These include Celtic, Norman, Viking, Anglo-Saxon, Latin, Gaelic and Ulster-Scots documents or oral traditions. We could aim to add to our growing understanding of our rich (if slightly overlooked) cultural connection with our landscape. This concept will not gain public or political support if it is focussed on the landscape itself. Therefore it needs to be rooted in people and our evolving society. We need to present this concept as an open invitation to all cultural and community groups to explore how their origins evolved in tandem with the landscape in which they were based. We need to encourage other groups, to re-examine their ancient relationship with the landscape. If our national population were magically removed and lived in France, New York or Turkey our shared culture would be quite ‘different’. So we need to celebrate this small landmass in the North Atlantic and explore its influence, over Millennia, on our current cultural identity. Wildlife people are primarily engaged in improving our landscape through management, policy, education, planning, legislation and awareness. But we often encounter pre-conceived negative attitudes, amongst key decision makers and the public, toward the environment. So we recognise the difficulties in overcoming these attitudes amongst society and sectorial representatives. 1) How relevant is this proposal to the respective goals of wildlife groups? 2) How can we make this proposal relevant to Irish Society in general? 1) Our shared goals are focussed on the current status of the environment and wildlife in Ireland. We are aiming to improve the status or condition of our relevant targets. But most of our goals are trying to restore or improve a landscape that has been shaped by previous human generations – sometimes in the distant past. We cannot achieve our goals, normally, without public support and therefore we need to examine and understand this history before plotting an agreed future. Many of us may not have the time, or see the immediate practical relevance, of exploring these issues. But if students, academics, volunteers or community groups start to look at their environment with increased awareness we can all benefit from the increasing environmental and nature ‘lore’ or wisdom and bring it to a wider public audience. We can either lead projects or assists others with same. This has significant public and political awareness potential, which will in turn help our respective current management priorities. 2) Community Groups, in particular, can become part of this landscape celebration. Placenames, old maps and oral traditions can be brought to the fore and placed alongside several seminal books on the cultural traditions based around the environment and the academic works on the early Irish environmental laws (Brehon Laws) as outlined by Professor Fergus Kelly. This can be used to enhance the pride and sense of place amongst local communities. This need not be limited to rural communities. For example, the people of Clondalkin, West Dublin, could be encouraged to establish a small local native meadow to reflect the prefix in their local placename, ‘Clon’, which was translated from ‘‘Cluain’, which is Irish for meadow. Basically, if we are imaginative, we can unleash a wide variety of small projects to celebrate or improve our landscape, if we can connect it to our human or cultural footprints. This could have environmental, cultural and social benefits. This brief outline, gives a flavour of a much more elaborate plan we could develop, in the autumn. These ideas need not be the sole aspect or the leading aspect of the 2016 events. But equally, could we suggest that we be as bold and as imaginative as possible. The Gaelic revival in the late 19th century sparked renewed interest in the Irish language, Gaelic games and Irish Literature and theatre. The rather unexpected Riverdance performance in the Eurovision song contest renewed interest in traditional dancing. At some stage, we need a “step-change” in public attitudes to the Irish environment, landscape and nature. In the current economic climate, the public and politicians will be looking for “added value” in any celebrations funded by the State. A mere 14 years after the event, how many of the National Millennium Committee projects have had a lasting residue? Could we establish an ancient farm and farm practices, from various periods, and manage an interesting array of wildlife in these habitats. Could we establish a national ancient wetland site with wet woodlands, bogs and reed beds? Could we see a Brehon Law visitor centre outlining the rules of one of Europe’s most ancient environmental law tracts? Could we establish an Irish Placename Visitor Centre? Just as our Diaspora have a keen interest in family genealogy, an Irish Placename Visitor Centre could explain the meanings of townland names, so many of which are connected to habitats, animals, birds and trees. Apart from family names, our Diaspora has the name of their original home/farm’s townland name etched in their family lore. The idea of celebrating the influence of nature on Irish culture can be of real benefit to the Tourism and Agri-Food sector. Both place so much of their foreign marketing and promotions on the Green image of Ireland. The idea of celebrating the interaction of humans and the environment can also create local and social benefits and be elastic enough to accommodate a wide array of Irish society. Presumably, in 2016, we will celebrate this Nation or Country, in some manner. A Country made up of dozens of separate groups of peoples who arrived here across the sea, since before the Iron Age. These people shaped the environment and wildlife, where they settled and lived. But crucially, these people and their culture were equally shaped or influenced by the same environment and wildlife of their new home. So this is a real opportunity to celebrate ‘Irishness’ and the environment in which it grew.